A couple years ago, I was inspired one day to start a dream restaurant menu, and began a note on my iPad with ideas for upscale, creative dishes based on the wonderful regional favorites of Upstate New York. It had takes on Utica greens, Buffalo wings, a St. Lawrence River shore dinner, spiedies, beef on weck, and more. I finished it off in August 2014. Check my iPad if you need proof! But of course, I don't actually have the cojones to start a restaurant! It takes big ones! Now, I don't know when the Upstate Tavern at the Turning Stone Resort and Casino opened, but I feel like they had to have had access to my private files, because they may as well have stolen the idea behind it and some of the menu itself, right out of my head. The space is masculine, dominated by exposed brick, distressed wooden shiplap, and tin ceilings. It feels a world away from the blinking, plinking casino floor. Comfortable, a little bit slick, and very cool. Many of the cheeses, condiments, and some other ingredients are sourced from New York purveyors, but overall, the appetizer list isn't really in keeping with our regional specialties. There are wings, yes, and also spiedies, but I'm curious what city in Upstate NY is known for fried oysters? In any event, we chose onion rings and poutine to start. 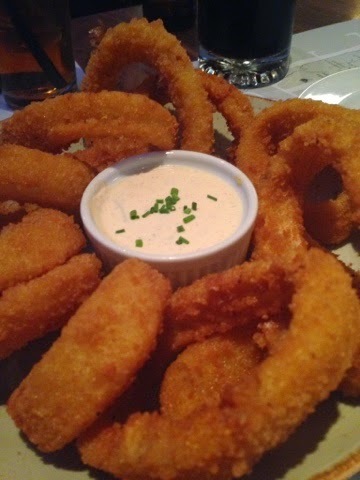 I would have preferred the onion rings to be beer battered, which also would have given them the opportunity to use a NY beer, but these were breaded. They didn't have a lot of flavor, but they were big, hot, and crunchy. The dipping sauce, however, was powerful - chock full of horseradish and spices. And when you bit into one, he onion didn't slide right out, which at least means someone in the kitchen knows their way around a ring. 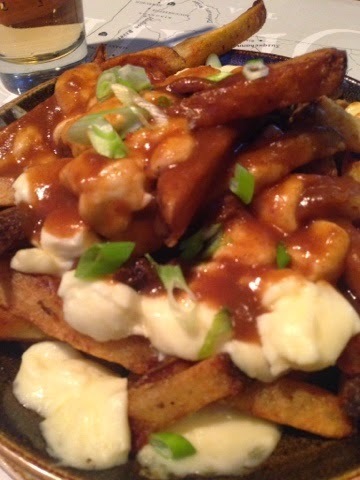 The poutine was markedly more successful, for me. Hearty, hand-cut, skin-on russet potatoes were smothered in Yancy's Fancy cheese curds, still sharp and squeaky (and therefore very fresh), plus a generous ladle of brown gravy with a sturdy backbone of beer, creating a savory dish with a slight hint of acidity and the salty sharpness of the curds. It was very good, and even the sprinkling of scallions on top made sense in the mix. The fish fry is done with Saranac Pale Ale in the batter, as I wish the onion rings had been. That batter was slightly sweet, owing to the abundance of hops in the ale, to be sure. It was thick, a bit greasy, almost like a funnel cake from your favorite Italian feast, but even crunchier. Just for reference's sake, the fishing camp fry on my fictitious menu is fried bass served on a salad with a slaw component and croutons made from hush puppy batter. Dressed with thousand islands dressing, of course. 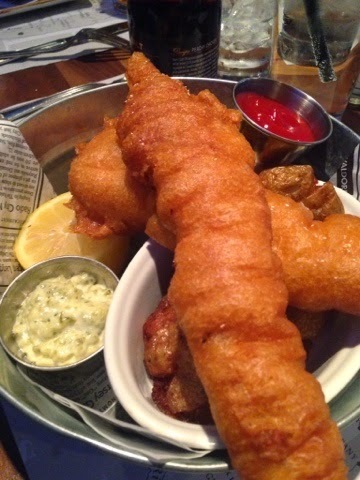 Instead of fries with the fish, we tried, "fried salties," or salt potatoes, smashed and deep fried. These are utterly delicious, a little fleshier than a fry, but really well flavored and addictively crispy. You also can get regular salt potatoes with your entree, which of course are a must-have on any good Upstate menu. A turkey burger was on special that day, and one of our diners tried it. I have no idea why a turkey burger with cranberry mayo has anything to do with Upstate New York, but that mayo was a winner. Maybe because people in NY celebrate Thanksgiving? I mean, people all over the country do that, but yes, those of us in NY happen to be in that camp, I guess. 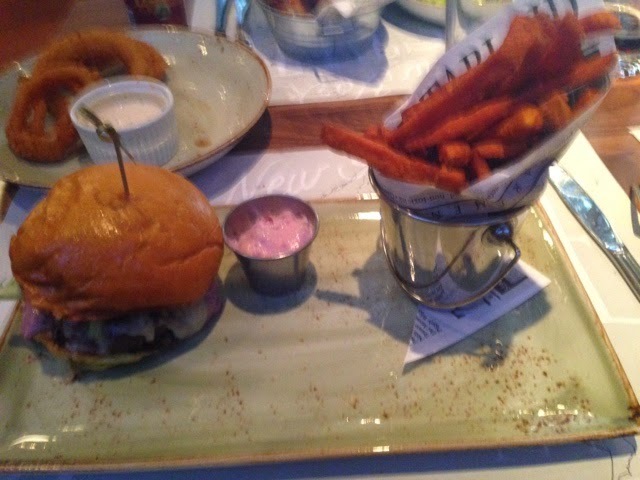 In any case, the burger was juicy, and that mayo was sweet and tart - peace. In lieu of Buffalo wings, one diner chose the Asian wings. They were very good - sticky, well done, meaty, and slightly spicy. However, the choice to serve blue cheese dressing alongside wings dressed in sweet Thai chili sauce made little sense. The pot roast was wonderful - boneless short ribs, fall-apart tender, over above-average, from-scratch mashed potatoes that were pointed up with tangy sour cream. The menu said this would be topped with "angry onions," but the little fried strings were only barely spicy with dried cayenne - I'd call them peeved, maybe. The carrots were well-seasoned, bright orange and still a wee bit crunchy in the center. Kind of perfect. 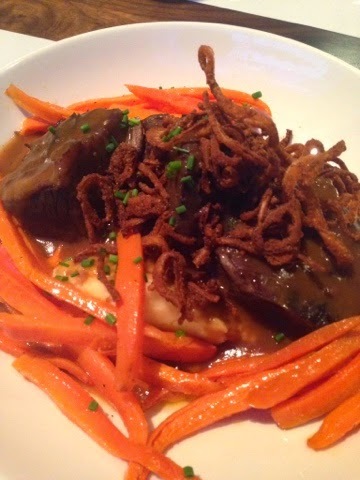 Again, I have no idea why pot roast is being served as an Upstate NY dish - I think of it more as a New England thing. I might have gone in a more Italian direction for the beef dish, as we have such a large Italian population - a braciole or garlic-rubbed ribeye, perhaps. 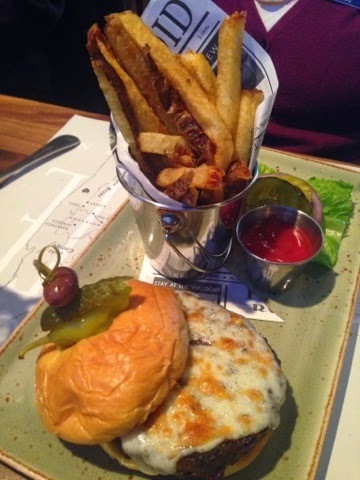 The Tavern burger was our last entree, and while I don't think of burgers an uniquely NY, they certainly are beloved here. The brioche roll on which this was served was chewy and buttery, toasted and yummy. But the burger was kind of boring, for me. The diner who ordered it agreed, saying the pickle and roll were the best parts. There certainly were more iconic dishes on the menu that we didn't try, but I felt like the food here was kind of up and down. The good things were very good, but the flaws were rather gaping, as well. Overall, I thought there should have been more ethnic foods on the menu to truly reflect Upstate's Italian, Greek, Polish, and Irish roots. Moreover, our waitress was so standoffish, we actually thought she might hate us. She would come to drop off food and be gone so quickly, not a single one of us could have asked for anything if we'd wanted to. I understand that this place is serving a casino crowd, which might dictate a much larger menu and economies of scale that might not seem logical for a normal restaurant with this cool a concept, but I wished it had been driven home a little more thoroughly. I give Upstate Tavern a six on the BHS Scale. They may have bogarted my big idea, but I have to give them props for that - and every potato product we ate there was outstanding. Hey, maybe that's the nod to our Irish neighbors! My personality is big; my hunger is bigger!